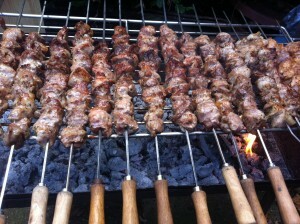 In Larnaca where I grew there was a very popular souvlaki (kebab) maker. Kitipos was his name. He and his wife ran their souvlaki shop in one of the busiest traffic-free roads in town. The shop doubled up as their home, with their humble bedroom located in a mezzanine. Come ten o' clock in the morning, Kitipos’ tables and chairs were out, not only on the pavement where his barbeque was permanently set up, but on the road too. It was a pedestrian street, and in those days there was no problem in taking over the space outside your shop without licenses or permits. Kitipos’ customers came from all walks of life – families, town hall officials, judges, bankers, tourists... everyone had tried his souvlaki. It was a popular and convenient souvlaki place, known for its cleanliness, the quality of meat and the friendly service, which came hand in hand with friendly chatting from the moment the shop opened in the morning until it closed its doors close to midnight. I never remember Kitipos or his wife looking tired or fed up with their late night clients (which often included us!). Kitipos’ wife was a quiet woman, constantly walking in an out of the shop checking on customers. She was never seen without a bowl in her hands, and she’d expertly be beating away at the contents of the bowl with a fork. For this was the tahini sauce she was making – that essential ingredient in any Cypriot souvlaki. She’d beat tahini paste, water, lemon juice, garlic and olive oil. When one bowl was ready, she’d move on to the next, keeping up the endless supply of tahini consumed throughout the day. Every single customer having souvlaki had a small bowl of tahini sauce placed on the table. Tahini sauce was included in the price, as well as a little plate with pickled peppers and spiky pickled caper leaves*. If take-away souvlaki was ordered then the tahini sauce and the pickles would go in the pitta bread with the souvlaki and vegetables (onion, parsley, tomatoes and cucumber). The story goes that when the shop opposite Kitipos’ souvlaki place was rented as a bank, its manager was not from Larnaca and he knew nothing about the locals who wanted to be the bank’s new clients. Kitipos realised this when someone he knew to be a crook walked in to the bank, then some time later came back out again looking extremely pleased with himself. Kitipos left his post, rushed into the bank and told the manager that the man was a crook, a dangerous client. There and then a contract was sealed between the banker and the souvlaki maker, agreed in the traditional way with a handshake. Kitipos was always out on the pavement over his barbeque, fanning the coals or turning the meat as it cooked, creating a mouthwatering and very distinctive smell throughout the neighbourhood. From his station outside his shop, he had a great view of the goings on along the entire street. Whenever he would see a ‘dangerous’ client entering the bank, his job was to shout out ‘Epikindinos!’ (dangerous). * I have not come across any other country where capers are mainly eaten as a whole plant – in Cyprus it’s not just the popular caper berries that are pickled, it’s the leaves and stalks too, spikes and all! It’s most likely a result of the fact that capers have always been popular and abundant in Cyprus, and of course in our mothers’ and grandmothers’ time, nothing was ever wasted. Capers are so abundant in Cyprus, in fact, that there is even a theory linking capers – ‘kapparis’ in Greek – to the name of Cyprus – ‘Kypros’ in Greek. Is it true? I have no idea! It’s one of those things you hear spoken of, but I’ve not yet come across the evidence to substantiate it. But one thing we do know for sure is that the name 'caper' comes from the Greek 'kapparis' (κάππαρις). The name was taken by Latin and became known as 'capparis' and later as 'capers'.